You have to see how one fatherhood program in Pueblo, Colorado is helping men learn how to be better fathers. Read this post to learn about the good work Graham Bates, the local pastor and police chaplain is doing, and to learn about Bates' vision for the program. The following post originally appeared here at NBC News 5 KOAA. You can view the video about the 24/7 Dad® Program here. The 24/7 Dad® Program at A Caring Pregnancy Center is currently in its second round of classes. Instructor Graham Bates tells News 5 that more than one-third of kids in Pueblo do not have a relationship with their father. That translates to 85% of inmates in jails and prisons who grew up without a dad. He and other organizers are working to change those statistics. Bates, a pastor and police chaplain, leads students like Andrew Cvevas through a workbook and exercises that teach not only emotional expression, but also how to be a positive role model. Cvevas has no relationship with his teenage daughter and has not seen his twin 10-year-old boys in years. After the boys' mother died, their grandparents took them in. "I'm trying to lift a restraining order on my sons, so I'm doing parenting classes," explains Cvevas. Bates, himself a father of two, says the key for many men is opening up about their emotions. In one demonstrative exercise, students write feelings that make them uncomfortable on a piece of paper, then throw them on the ground and try to walk around while hiding the piece of paper under a shoe. Bates compares the exercise to covering up how you feel in real life. 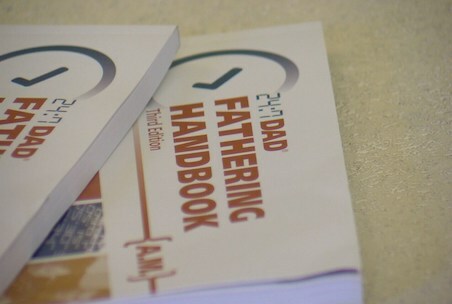 The course is not just for biological fathers. With many kids in Pueblo turning to gangs for role models, Bates sees a different kind of opportunity for the future. He says, "I would love to see gang leaders come and do this. Learn how to be a positive influence, take this back to their gang, so Pueblo is known for having the gangs who clean up people's yards and have the gangs that, whenever a girlfriend gets pregnant the guy steps up and becomes a dad." Students like Cvevas receive a certificate at the end of the 12-week course, which can be used in court during custody hearings. Bates also says he has seen marriages reconciled after men went through the training. He hopes more people will join the course in upcoming cycles. If you are interested, the class is completely free to the public. To learn more, click here.